Pearl has released an in-depth video series featuring Drum Corps International Hall of Fame member Thom Hannum. Renowned for his efforts as a drum corps arranger, instructor and clinician, over many years Hannum has worked with corps including the Crossmen, Cadets, Star of Indiana and on the design team of the Tony award winning stage show "Blast!." 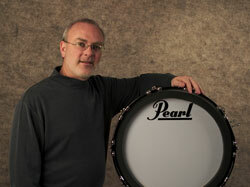 The new video series was put together in celebration of Hannum's 25 years as Pearl artist. Watch the four-part series on PearlDrum.com. View Hannum's DCI Hall of Fame bio.